The Anxious Art Of Japanese Painter (And 'Enemy Alien') Yasuo Kuniyoshi After moving to the U.S. in 1906, Kuniyoshi became a prize-winning artist. But with World War II, things changed. "When he walked down the street," says one curator, "he looked like the enemy." 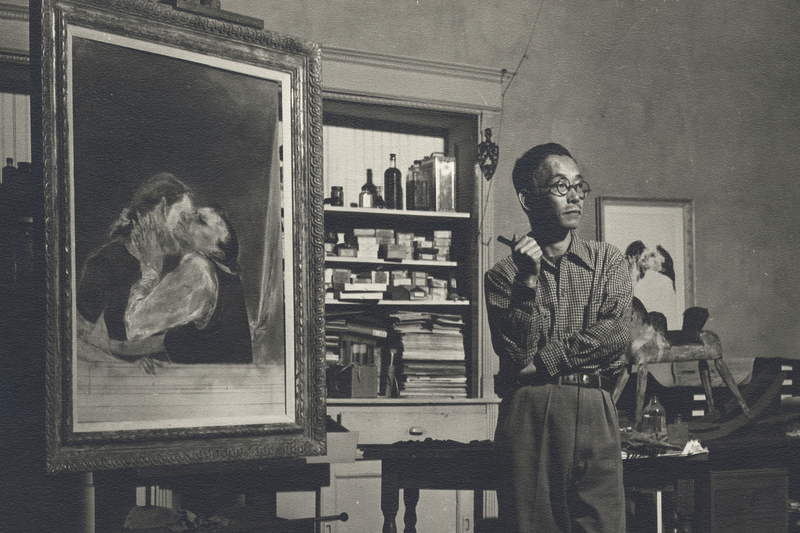 Artist Yasuo Kuniyoshi, seen here in his New York studio in 1940, exhibited with Georgia O'Keeffe and Edward Hopper. But his work was quickly forgotten after his death in 1953. In 1906, 16-year-old Yasuo Kuniyoshi came to the U.S. alone from Japan. He made his name as a painter and at 40 he was showing his work at the Museum of Modern Art in New York. But there was one thing Kuniyoshi longed for that he was always denied: American citizenship. In fact, he was classified as an "enemy alien" during World War II. Kuniyoshi died in 1953 and after that pretty much disappeared from public memory. But Tom Wolf — guest curator of a Kuniyoshi exhibition at the Smithsonian American Art Museum — says don't overdo the hardships. "He was a fun-loving guy," Wolf says. "He was a party animal, he had tons of friends, other artists loved him and he was so thrilled that he was able to became so successful. So it wasn't all suffering and tragedy." Curator Joann Moser says the peach in Kuniyoshi's Boy Stealing Fruit (1923) is likely a reference to a famous Japanese folktale. And Kuniyoshi was successful in his lifetime — right up there with Georgia O'Keeffe and Edward Hopper. "He exhibited with these people, he won prizes," says American Art Museum co-curator Joann Moser. But, she adds, after Pearl Harbor, things changed: "When he walked down the street, he looked like the enemy." And the anxiety of being Japanese-American during World War II shows in his work. The colors are somber; the faces he paints — highly stylized, flat and folk-artish — are often fearful; and babies and children are never cuddly. His Boy Stealing Fruit from 1923 stares warily, a banana in one hand while the other reaches for a peach. "There's a very famous Japanese folktale about a little boy and a peach," Moser says. "And so I think that is a reference to his Japanese childhood." The chubby child could be cute, but he's not. 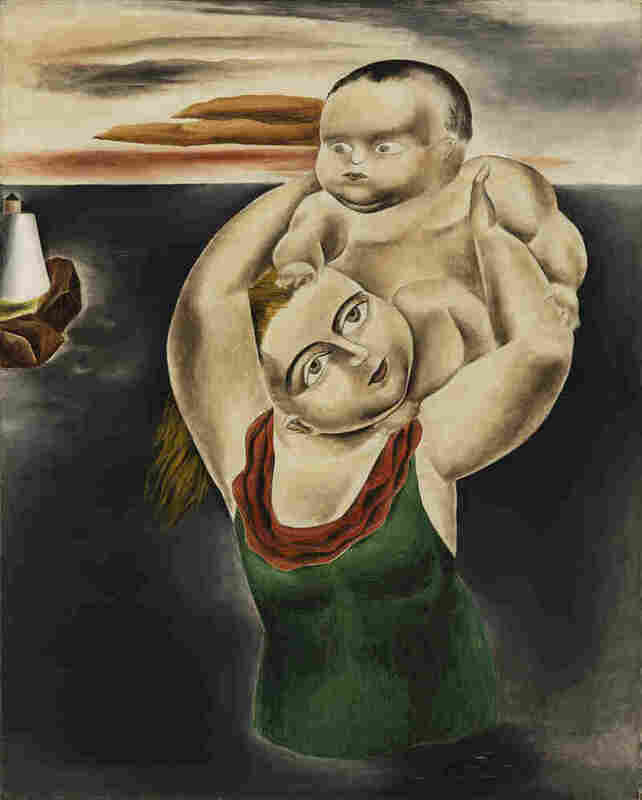 Neither is the baby on his mother's shoulders in another 1920s canvas — Child Frightened by Water. Even Kuniyoshi's bright fuchsia paintings from the 1950s have grim details — a reference to death on the Fourth of July or a scary face behind a colorful mask. The child in Kuniyoshi's Child Frightened by Water (1924) could be cute — but he's not. It's easy to see biography in Kuniyoshi's work. The fun-loving party animal had lots to deal with, and anti-Asian prejudice went back a long way. In 1919, Moser explains, Kuniyoshi married a white American woman who then lost her citizenship for marrying an Asian man. During the war, Kuniyoshi wasn't sent from New York to an internment camp like the West Coast Japanese were, but there were restrictions. "His camera was taken away from him," Moser says. "His binoculars were taken away. His bank account was frozen." But Kuniyoshi was devoted to America and was deeply patriotic. "So when the Department of Defense asked him to do some drawings for propaganda posters," Moser says, "he was eager to do that." He sketched a mother and child hanging from a tree as a Japanese soldier leaves the scene. In Clean Up This Mess, a woman's hand discards a bag filled with Japanese symbols, like a flag and a samurai sword. The posters never got made, but the anti-Japanese sentiment was clear. It must have been difficult for Kuniyoshi to repudiate his roots. "I think he was very torn and it was a terrible period in his life," Wolf says. 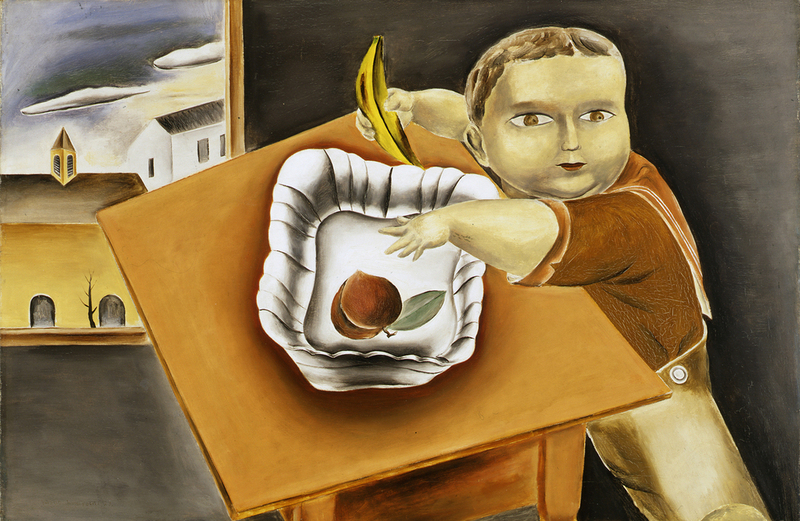 "The Artistic Journey of Yasuo Kuniyoshi" (at the American Art Museum through the end of August) is Kuniyoshi's first retrospective in more than 65 years. Abstract expressionism and newer movements nudged him off the art scene after he died in 1953. Curator Joann Moser says this show is a reminder of Kuniyoshi's American experience. "He was really one of the most highly respected and esteemed American artists," she says. "So within artist circles, he functioned very well; he had many friends. But outside the artist circles, he remained a 'Jap.' "
Over the years, the Japanese have bought up Kuniyoshi's work and he has become a popular artistic prophet in his native land.